According to an open letter published today, September 3rd, by Sajjad Ghaderzadeh, son of Mrs. Sakineh Mohammadi Ashtiani, under the pretext of the publication in the London Times of a photo of a woman without Islamic hijab, Sakineh has been sentenced to 99 lashes on charges of spreading corruption and indecency. On August 28, The Times mistakenly published a front page photo of a woman without Islamic hijab and attributed the image as that of Mrs. Sakineh Mohammadi Ashtiani. However, the photo was actually of another woman, Mrs. Susan Hejrat, a political activist living in Sweden. The photo of Mrs. Hejrat had been published earlier on a website along with her article about Sakineh. As soon as we became aware of the distribution of this picture by the London Times, and subsequently in the Aftonbladet newspaper in Sweden, we informed those publications that this picture in fact was not Sakineh. These papers have apologized to Susan Hejrat. The London Times, in its September 3rd issue, while correcting this mistake, also apologized to their readers for the error. They noted that this picture was obtained from Mr. Mohammad Mostafaei. The London Times also wrote that Mr. Mostafaei has claimed to have received the picture from Sajjad. Obviously this claim has no basis in fact whatsoever; furthermore, Sajjad has denied Mostafaei’s claim in his letter. It is Mr. Mostafaei’s responsibility to provide an explanation as to why he has disseminated counterfeit photo and information regarding Sakineh’s case; his action has only led to increased pressure on Sakineh and her family. We strongly condemn this barbaric new sentence of 99 lashes imposed by the Islamic Republic against Sakineh and we demand that this sentence be abandoned immediately. We take this opportunity to ask the media to be more meticulous in their reporting on this case. For the purposes of informing the public, we provide below the full text of Sajjad’s letter of September 3, 2010. 1. On August 25, 2010, our lawyer visited Branch 9 of the Supreme Court. At his urging, the court requested the original files on our mother’s case from Tabriz; as the case has now been referred to the Supreme Court for review, Tabriz no longer has jurisdiction in the case. For unknown reasons, Branch 9 has also requested the files concerning my father’s murder; however, the original files on his murder case have disappeared from Branch 7 in Tabriz, and the copies, which had been on file with the Homicide Unit of the Oskou Police Department, are also missing. This has led to a suspension of the proceedings in her case. I conclude this part of my letter with gratitude to human rights defenders and I wish them success in their sacred cause. 2. Subsequent to the August 20, 2010 London Times interview with our lawyer, Mr. Javid Houtan Kian, he sent the Times a photo of my mother taken when she worked at Arghavan Day Care Center in the city of Oskou. The picture was supposed to have been published the following day in the London Times; due to lack of access to the publication, there was no way for us to know otherwise. For unknown reasons, the London Times published a picture of another woman without hijab instead of our mother’s picture. We do not know how that picture was originally obtained, nor to whom the picture belongs. As we have not been able to meet our mother since her television interview, according to information coming from those released from the women’s ward last night, the publication of this picture has given the prison authorities an excuse to increase their harassment of our mother. My mother has been called in to see the judge in charge of prison misdemeanors and he has sentenced our helpless mother to 99 lashes on false charges of spreading corruption and indecency by disseminating this picture of a woman presumed to be her [Sakineh] without hijab. 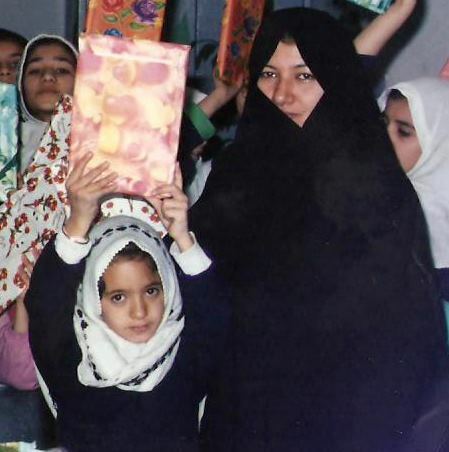 Later, through conversations with informed people outside Iran, I was told that the above-referenced picture, which was published instead of our mother’s picture, had been provided to the Times by our mother’s former lawyer (Mr. Mohammad Mostafaei), who I nevertheless thank for all of his contributions. I wish that this were not true and that they were mistaken. I would like to clarify that our mother’s court-appointed lawyers, Mr. Sohrab Samangan and Mr. Zaré, could not defend her and on the contrary paved the way for the stoning sentence and then contributed to this cruel sentence being upheld. Due to their incompetence, we approached Mr. Mohammad Mostafaei and he agreed to defend our mother both on an individual basis and as a member of a team of lawyers after having received a heavy sum of 20 million rials. According to undoubtable documents, this sum was paid to a woman lawyer sent by Mr. Mostafaei. As he did not make any effective legal or judicial efforts to save our mother’s life, and did not take advantage of existing legal avenues, according to the document sent on 30th Khordad 1389, Mr.Mostafaei was dismissed by my mother. Unfortunately, we still hear about his deeds and commentary, which suggests his unintentional collusion with those who are bloodthirsty within the system. Although I still hope that what we hear is not correct, but, today, I announce to all advocates of human rights worldwide that honorable Mr. Mohammad Mostafaei only for a short while, and via a woman lawyer, had the responsibility of the defense of our mother in her stoning case, and this case is separate from my father’s murder case. This means that he [Mr.Mostafaei] could not have been aware of files [of my father’s case], their contents and subject, their dates nor the responsible branch, in order to make any comment about them. Here we renew our gratitude and thankfulness to Mr. Mostafaei and humbly beg him not to make any further comments regarding our mother’s file or our father’s murder case to any authority or entity that is not confirmed by us. سكینه محمدی آشتیانی، مجددا به ٩٩ ضربه شلاق محكوم شد! طبق نامه سرگشاده ای که امروز ٣ سپتامبر سجاد قادرزاده فرزند خانم سکینه محمدی آشتیانی منتشر کرده است٬ به بهانه چاپ یك عكس بی حجاب در روزنامه تایمز لندن، سكینه مجددا به ٩٩ ضربه شلاق به اتهام “اشاعه فساد و بدحجابی” محكوم شده است! نشریه تایمز در تاریخ ٢٨ اوت یک عکس بی حجاب را به اشتباه بعنوان سکینه محمدی آشتیانی در صفحه اول خود منتشر کرد، در حالیکه این عکس متعلق به سوسن هجرت از فعالین سیاسی مقیم سوئد است که همراه با مقاله اش درمورد سکینه در یک سایت چاپ شده بود. ما به محض اطلاع از چاپ این عكس در نشریه تایمز و بلافاصله بدنبال آن در نشریه افتون بلادت در سوئد، به این نشریات اطلاع دادیم که این عکس متعلق به سکینه نیست. روزنامه های تایمز و افتون بلادت فورا از سوسن هجرت معذرتخواهی کردند و روزنامه تایمز در شماره روز ٣ سپتامبر خود در تصحیح این اشتباه و ضمن پوزش نوشت که این عکس را آقای محمد مصطفائی در اختیار آنها قرار داده است. روزنامه تایمز همچنین نوشت که آقای مصطفائی ادعا کرده است که این عکس را از سجاد دریافت کرده است. روشن است که چنین ادعائی مطلقا صحت ندارد و سجاد نیز در نامه اش اینرا تکذیب کرده است. توضیح درمورد نشر چنین جعلیاتی درمورد موضوع سکینه توسط آقای مصطفائی که تنها به تشدید فشار علیه سکینه و خانواده اش منجر میشود، به عهده خود آقای مصطفائی است! ما رفتار جنایتکارانه جمهوری اسلامی در قبال سکینه و محکومیت مجدد او به ٩٩ ضربه شلاق را شدیدا محکوم میکنیم و اعلام میکنیم که این حکم باید فورا ملغی شود. همینجا از رسانه ها تقاضا میکنیم دقت عمل بیشتری نسبت به این پرونده مبذول دارند. متن كامل نامه سجاد را جهت اطلاع عموم در اینجا منتشر میکنیم. 2- در پی مصاحبه نشریه محترم تایم لندن ؛ با وکیل اینجانبان آقای جاوید هوتن کیان ؛ به تاریخ 20 آگوست 2010 ؛ مشارالیه عکس مادرم را که ، مربوط به زمان کار مادر مان در مهد کودک ارغوان شهر اسکو بوده ؛ برای آن نشریه ارسال می دارد . که فردای ان روز به علت عدم دسترسی کل ما ، گمان می کردیم که عکس مورد چاپ در نشریه تایم لندن ؛همان عکس مادر مان در مهد کودک ارغوان شهر اسکو می باشد . – بعداً معلوم نمی شود ؛ چرا نشریه تایم لندن ؛ عکس یک خانم دیگر را که بدون حجاب می باشد ؛ بجای عکس مادرم چاپ نموده است وچگونه ابن عکس به ان نشریه محترم ارسال شده است ؟ و واقعاً عکس متعلق به کدام بنده خدا می باشد ؟ که با توجه به اینکه مادرم از هنگام مصاحبه تلویزیونی ؛ با اینجانبان و وکیل خویش ( آقای جاوید هوتن کیان ) ممنوع الملاقات گشته است ؛ حسب اطلاع از افرادی که دیشب از زندان و از بند نسوان آزاد شده اند چاپ همین عکس ؛ دستمایه آزار مادرم را فراهم نموده و بهانه بدست آنها داده است ؛ چرا که مادرم را به نزذ قاضی …. رسیدگی کننده به تخلفات داخل زندان تبریز برده ؛ ومشارالیه مادر بیچا ره ام را ؛ بخاطر اتهام واهی اشاعه فساد وبدحجابی ؛ از طریق انداختن عکس بی حجاب وپخش شدن آن ….؛ به 99 ضربه شلاق محکوم نموده است! I am very sorry to learn of this mistake, and I urge the government of Iran to cease its pursuit of physical punishment of Sakineh Mohammedi Ashtiani, an innocent woman. Гипотеза о происхождении традиции «побиения камнями». The hypothesis of the origin of the tradition of “Stoning”. Я утверждаю, что действительные основатели этой традиции имели в виду такой порядок применения, когда каждый раз в лице конкретного нарушителя правил общежития ПОБИВАЕТСЯ очередной рекорд по достижению максимального значения показателя эффективности применения этого наказания . И тогда на определённом этапе развития общества непременно перестанет быть возможным НАРУШЕНИЕ, относимое по составу признаков к заслуживающим такого наказания. Тем самым воспитательная традиция исчерпает весь заложенный в неё позитивный потенциал, почётно завершит свою историю и, может быть, послужит основой (краеугольным камнем) для закладки новой, ещё более эффективной воспитательной традиции. Но если вышеозначенная закономерность (увеличения рекордного значения показателя эффективности традиции от прецедента к прецеденту её применения ) перестанет наблюдаться , то и даже два подряд повторения экзекуции будет однозначным свидетельством включения отрицательного потенциала, связанного с жестокостью потерявшего смысл наказания. Что несомненно следует рассматривать, как издевательство над здравым смыслом вопреки традиции собирать его по крупицам и бережно хранить, чтобы передавать благодарным потомкам из рук в руки. Кто готов публично доказывать обратное, не выходя за рамки любых, включая собственные, определений для использованных мною понятий, пусть первым бросит в меня свой камень, приготовленный для поддержки древней воспитательной традиции. А пока, до завершения проверки моей гипотезы умнейшими, честнейшими и благороднейшими людьми нашей планеты, все приготовленные для поддержки древней традиции камни прошу считать равноправными изображениями одного и того же рекордного образца, условно обозначенного мною «BAZ216» и предназначенного, в том числе, для перенесения остатков позитивного потенциала древней воспитательной традиции в новую. Считайте каждый все те камни, которые символизирует причину и степень Вашего личного несогласия со мной, разновеликими и разновесными, но обязательно равноправными и равносильными, изображениями никак и никем никогда ещё не превзойдённого образца BAZ216. В знак благодарности за предоставленную возможность подкрепить мою теорию фактическим материалом, первым приглашаю заложить свой «камень» в основание новой традиции Президента Ирана Махмуда Ахмадинежада. Михаил Соболь (общесетевой псевдоним МАРНИЧ). Минск. 7 сентября 2010 г.